While I continue to update my fotki page, I thought that it would be a great idea to collage some styles that I create and post how I did them on here. Just in case you want some ideas on different styles. I got kind of creative last week and tried a frowhawk. I REALLY like this style. I'm all about keeping my hair protected! For this style you are going to need a rat tail comb, bobby pins and metal clips (to separate your hair into sections). That's it. When I did this style, start on whichever side you choose and make a part going down the side to the nape area. Use metal clips to keep hair separated. Then this is where it gets fun. Make your parts however you like! Get creative, zig zag, straight parts, whatever and twist toward the center. You are going to continue this and repeat the same steps on the other side. For the middle, I made small sections and just twisted all the hair in the middle. The reason I did this is to be able to wear the style until later this week when I get ready to re-do my hair. 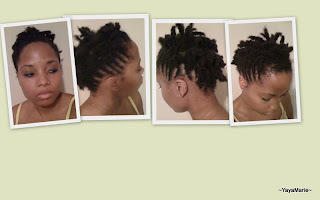 Also, a few days before I get ready to shampoo my hair I will untwist the middle section to REALLY have the "hawk" effect. Once you have completed twisting your hair, use a few bobby pins to hold the twists up on the sides. Viola! You are done! Enjoy your week! To maintain this style, sleep in a satin or silk scarf and if necessary use a little hair milk to moisturize your hair. I've gotten quite a few compliments on this hairstyle. I like it. One person told me that I switch styles all the time. I told the person "Thanks" and kept it moving.